"Mareng Winnie" threatens to haunt her students from the grave if they don’t give back to the country. Solita Monsod’s inspirational last lecture for the first semester of 2010. 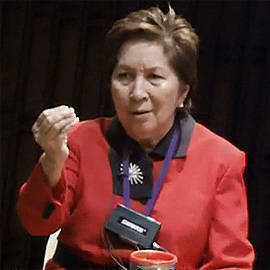 In this Youtube video that is currently going viral, Professor Solita Monsod, also known on TV as "Mareng Winnie" asked her Economics 100.1 (Introduction to Macroeconomic Theory and Policy) students at the University of the Philippines in Diliman (UPD) to pledge that they will never cheat, leave the country or add to its problems during her last lecture for the first semester at UPD School of Economics Auditorium on October 5. The economist and TV personality, who has been teaching in UP since 1963, is known to give inspirational messages to her students during her final lectures. "Honor and excellence," UP’s motto, was the topic of Monsod’s lecture. Monsod stressed putting honor before excellence because "we have always looked at excellence and not at honor and integrity," which has brought corruption and cheating in government. The professor also asked her students to pledge that they will not cheat "because once you cheat, you are now no longer part of the solution anymore, you are going to be very much part of the problem." Aside from reminding her students, about integrity, Monsod posed the challenge of helping the country by staying in the country: "If any of you have mga little ambitions of going abroad so that you can earn more, please disabuse yourself because by doing that, you are essentially betraying the people of the Philippines, who trusted you and who invested their money in you." (Part of the tuition of UP students are subsidized by the government using taxpayers’ money.) Monsod ended with her "last threat": "If you do your own way and add to the problems of the Philippines, Mrs. Monsod is going to haunt you from the grave...at the worst possible moments in your life!"